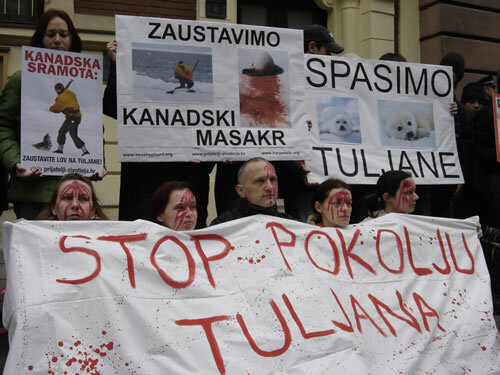 With "bloody" heads "smashed" by hakapiks, Animal Friends' activists will on Wednesday, March 15, 2006 express their opposing to the seal-slaughter in Canada. 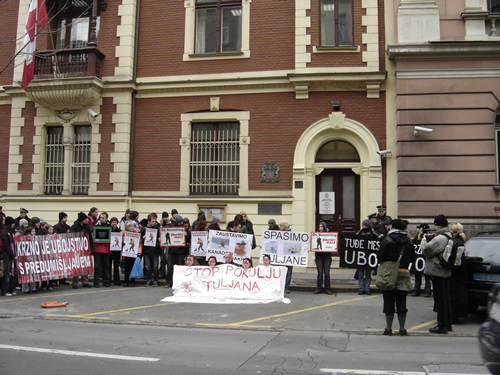 A figurative protest will take place at noon in front of the Canadian Embassy in Zagreb, Gjure Dezelica 4. At this moment, in more than 30 cities from all over the world protests against this year's seal-slaughter, which should begin in a couple of weeks, are being announced. This year, as never before in history, the biggest animal rights and welfare organizations united are organizing numerous joint protests - PETA - People for the Ethical Treatment of Animals, HSUS - The Humane Society of the United States, Sea Shepherd Conservation Society, IFAW - International Fund for Animal Welfare, WSPA - World Society for the Protection of Animals, IDA - In Defense of Animals, Harpseals.org and many others. 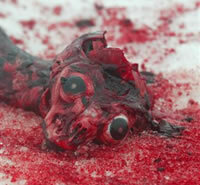 During the past three years, one million seal pups were slaughtered because of their fur. Shocking video footage and snapshots of the slaughter that circulated the world showed one week to one year old seals perfidiously being clubbed repeatedly and often skinned alive while their mothers looked on helplessly and wailed. 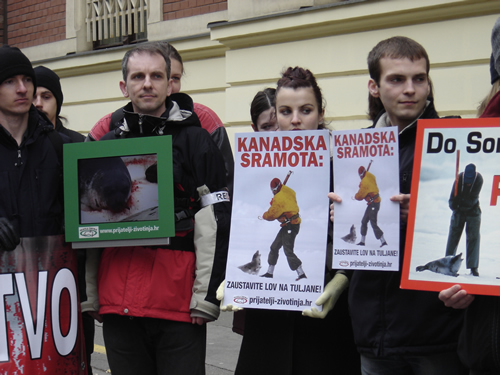 "The world today is ready more than ever before to stop this pointless slaughter," says Bernard Vjeran Franolic, coordinator of this campaign for Croatia. "Mexico, the United States, Greenland, the Netherlands, Belgium, and Italy already banned the import of seal fur from Canada, whilst this shows to be a trend in other European countries as well. Germany, the United Kingdom, and Luxembourg will also join the boycott of Canadian products, and we would be more than happy if Croatia would also show the same level of awareness." Paul McCartney, a longtime animal advocate and planetary popular musician, this month visited Canadian ice floes with his wife Heather in order to bring 350,000 seal pups in the Gulf of St. Lawrence, Newfoundland, and Labrador into spotlight. Besides melting of ice floes due to the global warming on which they grow up, they are threatened to be hunt and killed for profit on the cruelest ways. "Previous Canadian governments have allowed this heartbreaking hunt to continue despite the fact that the majority of its citizens - as well as those in Europe and America - are opposed to it," the McCartneys said in a joint statement. "We have complete faith that Prime Minister Harper will take swift and decisive action to end the slaughter of these defenseless seal pups for good." 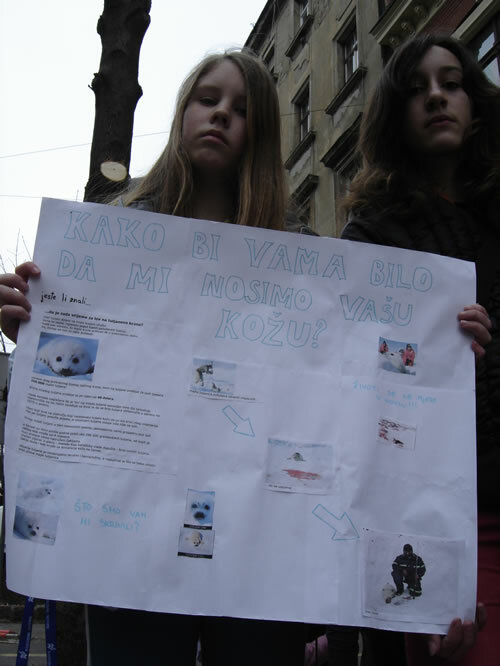 "Animals will be killed for their fur as long there is a demand on the market for it. Precisely for this reason, Animal Friends welcomes Mr. McCartney's and joint forces' from all over the world initiative who stood up in defense of seals. We hope that this wave of awareness on cruelty of the fur industry won't stop only on the seal pups, but will also, with its force and compassion, sweep over to other animals hunt and bred for their fur. 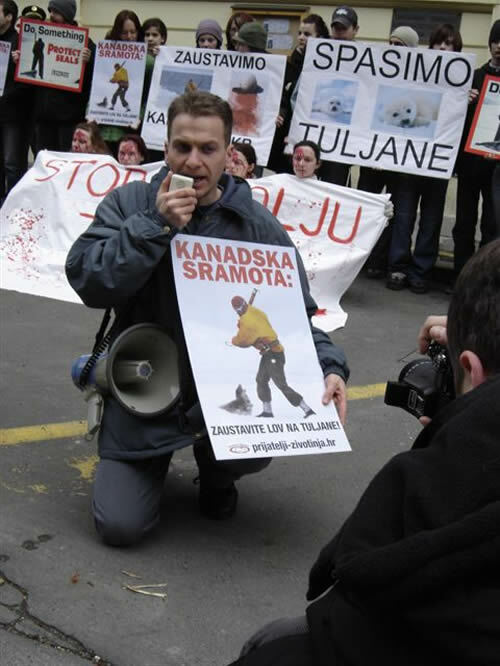 Croatia stands an excellent chance of realizing this by its new legislation that will, at least, regulate the ban on breeding animals for fur, for which it has support of our organization and the Croatian public," concludes Franolic. More information about the seal-slaughter in Canada at www.prijatelji-zivotinja.hr and in a short novel Look For Me Under the Rainbow. 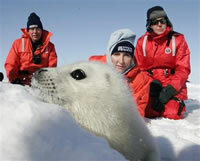 Everyone who wants to write to Prime Minister Harper and appeal on him to stop the seal-slaughter can do that at the Humane Society of the United States web site.